Montgomery(KW) The recent plethora of gay oriented sitcoms and reality shows has many Alabamians up in arms over televisions flagrant disregard for traditional family values. Skip Ansley, the Broadcasting Coordinator for the Christian Coalition of Alabama realized Alabama needed a response that was a little less Hell bound. "After making sure that episode of 'Ellen' never aired I had a lot of spare time and needed some way to spend all the money ALFA was sending me." After a lengthy statewide search, five young men were signed on to do the show. The "Fab Five" as they came to be known; Rodney, Ronnie, Tommy, Darrell and Rodney were all Christian men in their twenties who could serve as role models to Alabamas at risk straight population. Originally airing as a thirty-minute pilot entitled 'Straighten Out the Queer Guy', the show debuted to enormous ratings which have made it one of the most popular public access broadcasts in Alabama history. It is second only to Wild Turkeys legendary 'A Bear Bryant Christmas'. The shows local popularity drew nationwide criticism over the fact that most episodes involve a group of hetero men surrounding a gay man and beating him with bats. Ansley takes offense at what he calls "unfair characterizations" of the show. "The show isnt just about wailing on homos, its also about high school football profiles and NASCAR updates. Besides, our compassionate abuse is a small price to pay for the souls of these potentially straight men." The pilot caught the attention of Judge Roy 'Rudy Ray' Moore who took time out from his gubernatorial campaign to support the show. "Normally, I disavow television since it is not specifically mentioned in the Bible. I could not sit idly by, however, and watch as the gay agenda of shoes and stylish haircuts was pushed upon our unsuspecting young men." The show has been expanded into a new hour-long format in which each member of the Fab Five now has a chance to showcase his area of expertise. 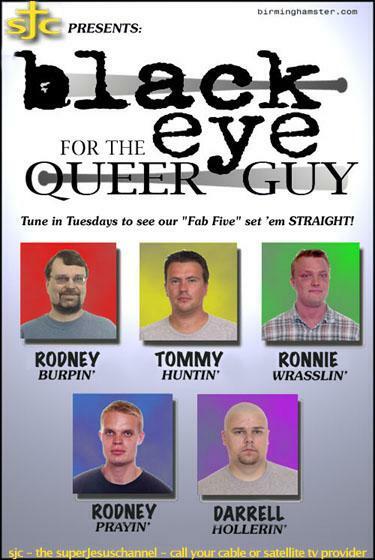 One recent episode featured Rodney trying to teach a gay guy how to spit by acting as a target. When the queer finally succeeded, Rodney commenced to wail on him. While some continue to criticize it, the show has received praise from groups as diverse as the Eagle Forum and the John Birch Society. Conservative pundit George Will perhaps best described the show when he stated, '"Its about a bunch of guys looking out for each other, no cocksucking  just friends." Tuscaloosa(JM) Beginning with the game against Northern Illinois, Alabama's football team will reach a nationwide syndicated television audience through the new high-pressure reality show 'Hot Seat,' presented by the 'Tide Fabric Care Network'. Viewers will see nine new coaching candidates join current Head Football Coach Mike Shula on the bench each week, and after the game, viewers will have the chance to call in and vote one of them off the sidelines. The series will conclude with a grand finale luau in Hawaii in which the identity of the Tide's new full-time coach will be revealed. Alabama's Associate Athletic Director for Media Relations, Perry White, expressed excitement about the new concept, "The chance to partner up with Tide to put Alabama football on a nationally syndicated stage is wonderful for the university. This gives our fans, old and new, a chance to get involved with the program on the field through their television sets, and will give us in the Athletic Department a chance to spotlight the qualities that make Crimson Tide football unique." When asked whether the show might undermine a growing outpouring of support for acting head coach Mike Shula, White shrugged it off, "I know a lot of people are jazzed about Coach Shula, but this is an idea thats been in the works behind the scenes since last April when the allegations about Coach [Mike] Price surfaced and [American Idol contestant] Ruben [Studdard] was winning over the state in a big way. If fans are excited now, wait until they see Mike arguing for play calls against his father, Don, the all-time winningest coach in the National Football League, or going head to head with Big Al on a tough call at fourth and long!" 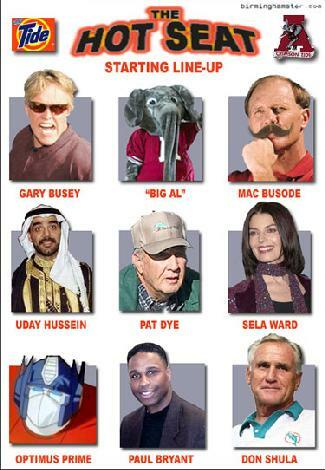 Other coaches slated to join the fray include Gary Busey who once played Bear Bryant in a movie, Uday Hussein, notorious for his unconventional methods of motivating athletes, and Optimus Prime, the courageous former leader of the Autobots who promises to "transform this team into a juggernaut." Two former head coaches are also in the mix. Pat Dye (Assistant from 1965-1974) will come out of retirement to coach his old team and Mac Busode, a high school head coach from Dothan will try to make a name for himself in Division I. Joining Busey from the entertainment world are Sela Ward, a former UA cheerleader and Homecoming Queen who once dated "MacGyver," and Paul Bryant, whose radio show, "Inside Urban America", airs Sundays, 2 to 3 p.m., on KKAR 1290 AM in Omaha. Gardendale() Gardendale native James Whitcomb was duped into attending a concert given by The Alabama Symphony Orchestra last Saturday in the wiccan park on Highland Avenue. The event was a kickoff for the new Masterworks season which begins this Friday. "My wife told me I'd like it since it was about my car," said Whitcomb. "I hadn't been to the symphony since fifth grade and thought it was only for those high-fallutin' types. But my wife told me that I needed some culture and that besides they would be playing a song about my car. Well when I read the program notes I got confused because there were no pictures of my car." The orchestra went on to play Stravinsky's monumental work to an appreciative audience while Whitcomb continued to study the program. 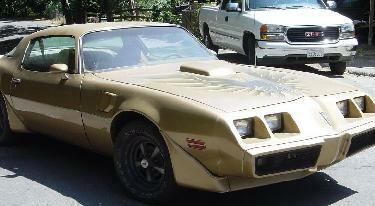 "I'm pretty sure there wasn't anything in there about a Pontiac," said Whitcomb. "But to be honest, I couldn't understand much of that Rhodda guy's stilted prose." Whitcomb's wife is said to have enjoyed her evening.